Aadhaar is a 12 Digit Unique identification Number which never starts with a 0 or 1. It is randomly generated By Uidai ECMP Software. Its is Provided to Residents of Indian Nationality. The Unique Identification Authority Of Indian Government has started issuing Aadhar Number.UID Issue Aadhaar Card to Indian Citizen from September 2010 . Before Aadhaar Card ,We have to carry different types of Identification and Address Proof Documents like Ration Card ,Pan Card ,Electricity Bill , Water Bill, Telephone Bill , Voter Card etc.It was a monotonous task to Show different Documents at different Places. This Problem is Solved by Aadhaar Card and Now You can Use Aadhar card Both as an Address Proof and an Identity Proof Documents. An Individual can get only one unique 12 digits Aadhaar number across India.That is strong enough to eliminate fake and duplicate identities.And it can be authenticated and verified in an easy and cost-effective way online anywhere, anytime. Uidai is The Unique Identification Authority of India was initially set up by the Govt. of India on 28 January 2009.The Main Task Assigned to Uidai is to provide a 12 Digit Unique Uid Aadhaar Number to Every Indian Citizen. The uid number is linked to the citizen’s basic biometric and demographic information such as a photograph, 10 fingerprints and 2 iris scan, which are stored in a centralized database management system. The UIDAI data center is located at IMT Manesar,Near Gurgaon,Haryana. Unique identification project was initially conceived by the Planning Commission as an initiative that would provide identification for each resident across the country and would be used primarily as the basis for efficient delivery of welfare services.So It would also act as a tool for effective monitoring of various programs and schemes of Indian Government. UIDAI has been given the responsibility to assign UID to everyone and maintain the database and other operations. UIDAI distributed this task in private enrollment agencies in every region.Currently,The Major Enrolment Agency is KARVY DATA MANAGEMENT SERVICES which enroll 50 Million People in record time. The UID (Unique Identification) and NPR (National Population Register) Scheme are both government identity schemes that collect personal data,including biometric data for the provision of an identification factor and aim to link them with the delivery of public utility services. The differences between the two exist in terms of a collection of data, the type of identification factor issued, authorities involved and the outcome. In 2010, the Government of India started the NPR which means the creation of the National Citizens Register. This register is being prepared at the local, sub-district, district, state and national level. The database will contain thirteen categories of demographic information and three categories of biometric data collected from all residents aged five and above. The Collection of this information was initially supposed to take place during the House listing and Housing Census phase of Census 2011 during April 2010 to September 2010. The NPR is legally grounded in the provisions of the Citizenship Act, 1955 and the Citizenship Rules 2003. It is compulsory for every usual resident in India to register in the NPR as per Section 14A of the Citizenship Act, 1955, as amended in 2004. The collection of biometrics is not accounted for in the statute or rules. Aadhar is a 12 Digit unique ID for every Indian resident including NRI and Children. Establishment unique Biometric and Demography report to track every person. Addhar is not a Mandatory document as mention by Supreme court Of India. Aadhar will help us to provide universal identity infrastructure. Aadhaar card Number will be unique and never start from “0” and “1” . You can Update Uid details as many times as you want by providing proof of supporting documents. One Person One Aadhaar : Aadhaar Card is a unique 12 digit number, and no resident can have a duplicate uid number since it is linked to their individual biometrics details; thereby identifying the fake and ghost identities which result in leakages today. Savings from removing duplicates and fakes id through Aadhaar-based identification will further enable governments to expand benefits to other eligible citizens. Portability to Confirm Identity : Aadhaar is a universal 12 digit number, agencies and services can contact the central Unique Identification database server from anywhere in the country to confirm a beneficiary’s identity. The Inclusion of those without any existing identity documents:A problem in reaching benefits to poor and marginalized residents is that they often lack the identification documents they need to receive State benefits; the “Introducer” system which has been approved for data verification for the UIDAI will enable such residents to establish an identity. Electronic benefit transfers: The UID-enabled-Bank-Account network will offer a secure and low-cost platform to directly remit benefits to residents without the heavy costs associated today with benefit distribution; the leakages in the current system will also be stemmed as a result. Aadhaar-based authentication to confirm entitlement delivered to the beneficiary: The UIDAI will offer online authentication services for agencies who wish to validate a resident’s identity; this service will enable confirmation of the entitlement actually reaching the intended beneficiary. Improved services through increased transparency: Clear accountability and transparent monitoring would significantly improve access and quality of entitlements to beneficiaries and the agency alike. Self-service puts residents in control:Using Aadhaar as an authentication mechanism, residents should be able to access up-to-date information about their entitlements, demand services and redress their grievances directly from their mobile phone, kiosks or other means. In the case of self-service on the resident’s mobile, security is assured using two-factor authentication (i.e. by proving possession of the resident’s registered Mobile Number and knowledge of the resident’s Aadhaar PIN). These standards are compliant with the Reserve Bank of India’s approved standards for Mobile Banking and Payments. Aadhar Card UID Eligibility – Every Indian Resident is eligible for register yourself for Aadhaar Card across the India. 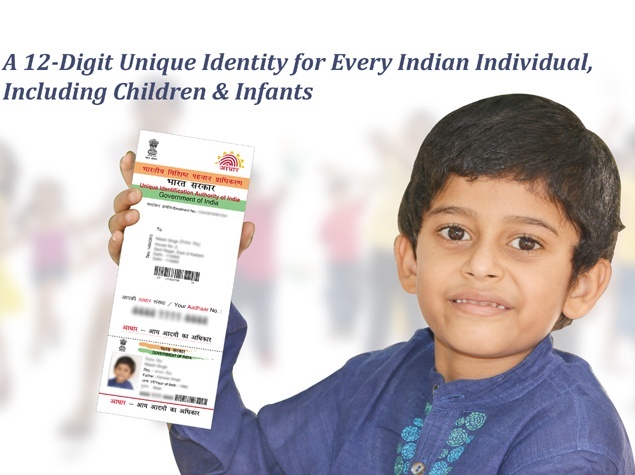 Aadhar Card For Kids and Children – Kids above 1 year is eligible for uid aadhar registration but their biometric data such as fingerprint and eye scan will be collected after they turned to 5 years.And After 15 years final data will be collected. Kids and children enroll with their parent’s Aadhar Number and Address. Addhar Card For NRI – Aadhar Card is for all Indian citizens and hence any foreign Indian citizen want to register for aadhar then they have to physically present in any aadhar enrollment center and register their aadhar .The Document will be same as mention below. How Can Apply For Aadhaar Card? Aadhar Card Registration Process|Uid Enrollment Steps – As You Know that aadhar is very important documents now and you have to register yourself as soon as possible. You can apply for Aadhar Card By Online Booking and Offline Registration . The Online appointment facility is not available at all centers but you can go offline at any nearby center. You have to Fill Aadhar Card Registration Form and Submit Address proof ,ID Proof and Date of Birth Proof along with Form. Please Note that all documents should be self-attested.The Aadhar Enrolment Agency will submit all details and take your fingerprints and eye scans . Aadhaar Card is an Indian Government initiative To get Register their Residents. The Unique Identification Authority of India UIDAI has been authorized To collect the database and Government providing all funds for Aadhar.Registration of Aadhar Card is Free of Cost across Country ,No One can Ask Fees For Aadhar Enrollment.You can go freely to aadhar center and register yourself without paying a single rupee. Registration of Aadhar Card is Free of Cost across Country ,No One can Ask Fees For Aadhar Enrollment.You can go freely to aadhar center and register yourself without paying a single rupee. However,Enrollment agencies of Aadhar card are openly demanding some money Rs. 100 from everybody as fees.This is illegal and should be stopped and you have to a complaint that agency in Aadhar Toll-Free Helpline Number – 1947 . If You have been Ask to Pay any Money for Addhar Card Enrolment then You can Register complaint at local authority/City Magistrate/Deputy Commissioner . You Can also Contact Us For Help and Comment Below your query for any guide and Support.We will be happy to Help You . The Most Important things you keep in Mind while going for aadhar enrollment is that which type of documents you want in Uid registration. Basically,The Government has Decided to Verify and Check three types Of Documents listed Below. You have to Submit “Proof of Identity”, “Proof of Address” and “Proof of Date of Birth”.The DOB Proof is required in Aadhar Card otherwise some random Birth date will be submitted . Below you will find a valid list of supported Aadhar card documents across India. You will need to carry the original AADHAAR card documents to the AADHAR card center for cross verification with One Photo Copy of each Document. Your original documents will be returned back to you immediately after verification with corresponding photo copies at the center. You have to carry just one document for “Proof of Identity“, one document for “Proof of Address” and one document for “Proof of Date of Birth”. Don’t Forget to take 1 photocopy of each of the supporting uid card documents you are submitting for aadhar card and submit it along with the AADHAR card application form. Please note that you are not required to carry your passport size photographs, as your photo will be taken right at the AADHAAR card center using computer webcam . Small kids may not have any address proof. So,In that case, submit your own address proof document copy for them along with their Birth Certificate issued by Birth Registrar. For above documents,where the original document does not have a photo. The photocopy/scan of the documents must be taken along with the Resident’s photo. Caste and Domicile Certificate having Photo issued by State Govt. For More AADHAAR Related Query You Can Comment Below.Share your information with us, we are happy to Help You. Please Share this post with your friends and all to Help Digital India Initiative .